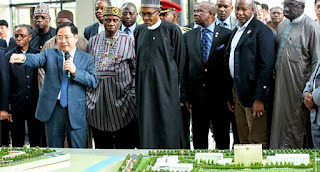 President Muhammadu Buhari on Thursday in Shanghai said that his administration would give priority to the building and development of resilient and viable cities comparable with other developed cities across the globe. At separate meetings with the Mayor of the Chinese city of Shanghai, Mr Yang Xiong and the Director of Shanghai Free Trade Zone, Liu Fangzhou, President Buhari said that the Federal Government would give full support to Free Trade and Export Processing Zones in the country to spur rapid economic development. The President, who visited the Shanghai Free Trade Zone, said Nigeria was prepared to learn how to make its cities more viable from those that have achieved development. Commending the hardwork and incredible success story of the city of Shanghai, President Buhari said that the virtues of hard work were central to every human achievement and development. In his remarks, the Mayor of Shanghai expressed the willingness of several Chinese businesses to key into the vision of the Chinese President, Xi Jinping, for Africa by investing in Nigeria. Also speaking, the Director of the Free Trade Zone commended the effort of the Nigerian government towards the diversification of the economy and encouraged the country to focus on a favourable policy environment to encourage foreign investors.